The Western Australian Wheatbelt is full of charming character townships, fresh local produce, and rural farmland. We have put together a list of our favourite nearby attractions for you to consider. Feel free to chat to our staff; they will be happy to offer their advice to help you make the most of your stay. 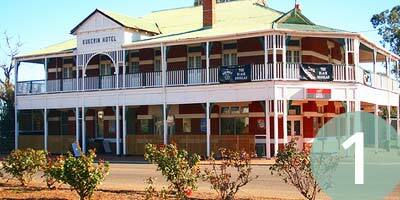 You can also check out Australia's Golden Outback or Wheatbelt Tourism websites for further ideas. Mary's Farm Cottages is the perfect place to stop for a break on your way from Perth to Esperance and also a great place to visit in its own right. While you are here, come and visit the family's 'state of the art' yabby (fresh water crayfish) establishment. Cambinata Yabbies is the largest and most sophisticated yabby processing facility in Australia. Here you can enjoy a tour and have the opportunity to purchase delicious gourmet products that you can enjoy and take home as gifts. Pre-ordered steamed yabbies are available either at Cambinata or delivered to your cottages. Mary's Farm Cottages are located on a working farm. Tractor rides and farm tours are available at a small extra cost. Choose one of the following scenic routes to explore Western Australia’s Wheatbelt region. From Perth, drive down the Albany Highway to ‘Halfway House’ at Bannister, then travel through bushland and undulating farmland to Wandering where you can take a break and sip local wines. Travel on through the Dryandra Forest taking a pause to enjoy its beauty. Stop off in Narrogin to visit Downderry Wines. 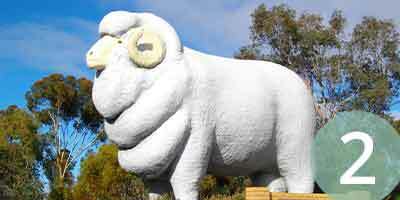 Travel to Wagin to see their historical village and the Giant Ram. Journey on towards Dumbleyung, stopping off to view Dumbleyung Lake, where Donald Campbell broke his water speed record in 1964, and the Bluebird Museum. Enjoy the friendly atmosphere of the local hotel in Kukerin. Mary's Farm Cottages are on the main road five minutes east of town. From Perth, take Brookton Highway to Brookton, enjoying the beauty of the forest. Turn right and travel on through Pingelly where you can turn off to Wickepin – visit Facey’s Cottage and then journey on towards Harrismith, the place of ‘Wildflowers and Wild Times!’ Travel down the historic Fence Road (so called because a fence was erected here to keep the rabbits out) and then turn left, heading towards Lake Grace, and travel another 16 km to arrive at Mary's Farm Cottages and Cambinata Yabbies. You may choose to leave the main road and visit Kukerin and the local hotel or Emu Essence’s emu farm prior to your arrival. From Mary's Farm Cottages, journey back through the most biodiverse bushland in the Blackwood Catchment, enjoying the myriad of wildflowers along the roadside to Lake Grace. At the town you can visit the ‘Flynn of the Inland ‘Flying Doctor’ Hospital’ and Lake Grace Visitor’s Centre before journeying on to Walker’s winery on the road to Hyden. 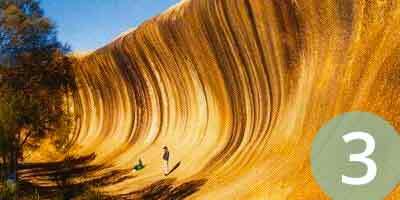 Once you reach Hyden you will enjoy the wonder of Wave Rock which is just over an hour’s journey from our door. From Hyden travel along the Tin Horse Highway to Kulin, and then to Corrigin, ‘Dog in a Ute’ country, before winding your way to Perth via Brookton.